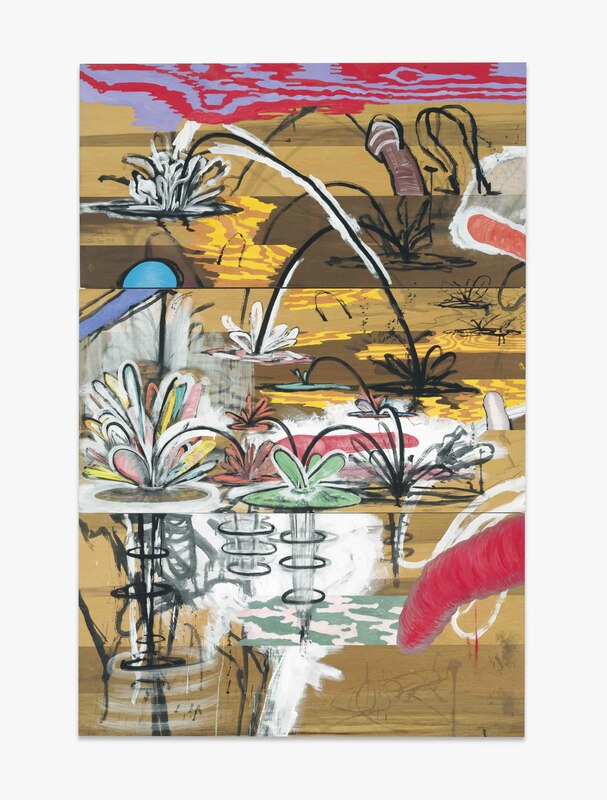 Painted in 1984, Carroll Dunham's Poplar presents an energetic and frantic painting from Dunham's series in which he explores the new medium of creating paintings on wood panel. This series, created in the early-mid 80s, was not only influenced by Dunham's exploration of a new material and process, but drew inspiration from Dunham's own life. The wooden panels of Poplar, recall Dunham's childhood home, which the walls were never painted, but exposed raw pine wood. A whimsical and fantastical painting created on three abutting panels made of poplar wood, the present lot explores Dunham's idiosyncratic colorful and cartoonish rendering of human anatomy. In this important series Dunham considers a new form of medium and how this new medium affects his artistic output. "I was very attracted to the material, and I liked the thought process it triggered. In the beginning it was a more conceptual, or philosophical relationship. Plywood was a common material that seemed ripe to be considered in a new way, and it bypassed conventional notions of painting support in a way that appealed to me. As I became more aware of the exotic types available, and then the fancy veneers being made for cabinetmakers and architects, my attachment became more sensual, and that pushed the paintings in a direction I hadn't foreseen. I started to construct the panels with different zones on their surfaces, and new types of imagery, like the balls and rings, appeared in response to characteristics of the material." (C. Dunham to L. Simmons, Carroll Dunham: Paintings on Wood, New York, Skarstedt Gallery, 2008). Emerging in the 1980s, while the Pictures Generation critiqued the myth of originality and the multicultural frontiers pushed their cultural wars, Dunham's work hums its own Surrealist agenda entrenched in the various angst of this decade onward. Rapid technological change was on the forefront, globalization was exploding, the Wall Street market was booming - chaos surely ensued. Dunham's paintings through the 1980s capture this and are abundantly veiled with imagery and symbolism of the time. And somehow within this contemporary dialogue the doodles and scribbles immediately harken to Cy Twombly's graffiti, the brightly colored phalluses can be likened to Philip Guston's exploration of vibrantly colored figures, the delicate surreal lines pay homage to Joan Miro, and the interest in the grotesque invite a discussion with Jean Dubuffet and his l'hourloupe series. However, beyond this hasty rooting in some of art history's best known painters is an artist fixed in his own vision and metaphor - depicting an existential crisis that is somehow comical and jolting in all its line, sludge and lumps. Please note the work is also signed and dated 'Carroll Dunham Jan-June 1984' near the lower left corner of the upper element.